We are currently exposing 100’s of thousands more service members to the elevated risk of this disease. There will be young men, women, and families celebrating a return from Iraq and Afghanistan alive, who have no idea that they may soon be facing a certain death from ALS. We will have to answer those families when they ask what the government has been doing to prepare for this onslaught. For this reason, the government is compelled to assume leadership of this issue. If these soldiers were dying in the field …. rather than quietly at home as a consequence of their service, we would leave no stone unturned. We would use the best existing resources and programs to make sure they had whatever they needed to survive….to ensure that no man or woman is left behind. In 2001, the Veterans’ Administration and Department of Defense rightly recognized the relationship between Gulf War service and Amyotrophic Lateral Sclerosis (ALS), commonly referred to as Lou Gerhig’s Disease. At that time the V A duly decided that Gulf War veterans with ALS automatically received a service connected disability. It also expedited ALS cases because this relentless disease, which is a death sentence, progresses so rapidly. This decision was widely applauded because of the compassion it showed to those who have served our country so bravely. These findings would suggest that the V A is therefore only granting benefits to a specific portion of those exposed to whatever trigger is responsible for our veterans’ increased risk. How can we differentiate between all veterans with a 1.6 higher incident rate and Gulf War veterans with a 2.0 higher incident rate than the general population? Because of the appropriate precedent set in 2001 and the additional studies subsequent to that, the V A should now grant service connected disability to all veterans! I would be more than happy to discuss this further with you or your staff. You may contact me at 843-971-5000. Mikolajcik’s efforts for veterans with ALS meet with success. 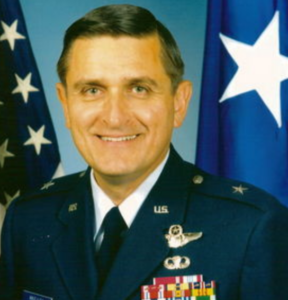 In September of 2008 it became a presumptive disease in the VA.
Brigadier General Thomas Roy Mikolajcik USAF (Ret. ), age 63, husband of Carmen Heft Mikolajcik was Killed in Action April 17, 2010 after battling ALS for six and one-half years.